Intestinal dendritic cells (DCs) send processes between epithelial cells into the gut lumen to sample pathogens. Noninvasive enteropathogenic Escherichia coli (EPEC) colonize the gut using a type three secretion system (T3SS) to inject effector proteins into epithelial cells. We hypothesized that EPEC might also inject proteins into DC processes to dampen immune recognition. Using a T3SS-linked fluorescence resonance energy transfer-based system we show that EPEC injects effectors into in vitro grown human myeloid DCs. Injected cells emit a blue signal due to cleavage of the green fluorescence resonance energy transfer-based substrate CCF2/AM by β-lactamase. When cultured with a mutant EPEC unable to translocate effector proteins, myeloid DCs show rapid activation of NF-κB, secrete large amounts of proinflammatory cytokines and increase expression of CD80, CD83, and CD86, whereas wild-type EPEC barely elicits cytokine production and shuts off nuclear translocation of NF-κB p65. By deleting effector protein genes, we identified NleE as being critical for this effect. Expression of NleE in HeLa cells completely prevented nuclear p65 accumulation in response to IL1-β, and luciferase production in an NF-κB reporter cell line. DCs cocultured with wild-type EPEC or NleE-complemented strains were less potent at inducing MLR. EPEC was also able to inject effectors into DCs sending processes through model gut epithelium in a transwell system and into Peyer’s patch myeloid DCs. Thus, EPEC translocate effectors into human DCs to dampen the inflammatory response elicited by its own pathogen-associated molecular patterns. Gut dendritic cells (DCs) directly sense and sample commensal gut bacteria and pathogens by sending processes between gut epithelial cells into the lumen without disrupting epithelial integrity (1–3). They then migrate to the mesenteric lymph nodes where they generate protective immunity to pathogens or tolerogenic noninflammatory responses to commensals (4). The cues received by DCs that allow them to distinguish between pathogen-associated molecular patterns (PAMPs) on pathogens and commensals are poorly understood. Enteropathogenic Escherichia coli (EPEC) is one of the main causes of infant diarrhea in developing countries. EPEC is noninvasive but colonizes the surface of intestinal mucosa using the type three secretion system (T3SS) to form attaching and effacing (A/E) lesions on the surface of gut epithelial cells (5). A number of studies have shown that EPEC elicits a proinflammatory response in gut epithelial cells (6, 7). However, other work suggests that the situation is more complex, and that EPEC can also reduce cytokine production (8–11). Because inhibition of cytokine production is dependent on a functional T3SS (8–11), EPEC may also inject inhibitory effector proteins into epithelial cells. EPEC, as well as enterohemorrhagic E. coli (EHEC), show tropism for the follicle-associated epithelium (FAE) overlying organized gut-associated lymphoid tissue (GALT), including Peyer’s patches (PP), in the early stage of infection (12). GALT is also the site at which protective mucosal immune responses to pathogens are generated, and the subepithelial dome region of GALT contains large numbers of immature DCs (13). We therefore hypothesized that it would be advantageous to EPEC to inject effectors into DCs as they reach into the lumen, to subvert protective immunity. In this study, we show that this is indeed the case and have identified the EPEC protein NleE as an effector, which downregulates NF-κB activation and proinflammatory cytokine production in DCs. GM-CSF and IL-4 were purchased from PeproTech (London, U.K.). IL1-β was bought from R&D Systems (Abingdon, U.K.). If not stated otherwise, reagents were purchased from Sigma-Aldrich (Gillingham, U.K.). Anti-CD11c (Abcam, Cambridge, U.K.), anti-Tir (from Gad Frankel), anti-myc clone 4A6 (Cambridge Bioscience, Cambridge, U.K.), rabbit anti-p65 (Santa Cruz, Heidelberg, Germany), anti-occludin (Santa Cruz). Secondary Abs were conjugated to Cy3, Cy5, Alexa 555, and Alexa 488 (Invitrogen, Paisley, U.K.). CD11c-APC, TNF-α-PE-Cy7, HLA-DR-PE-Cy7, CD80-FITC, CD83-FITC, and CD86-FITC and appropriate isotype controls were all purchased from Becton Dickinson (Oxford, U.K.). PE-Cy5-conjugated DC exclusion mixture (Abs against CD3, CD14, CD16, CD19, CD34): AbDSerotec, Oxford, U.K.; anti–I-κB α and anti–NF-κB p65 (Santa Cruz), anti–phospho-I-κB α (Cell Signaling, Danvers, MA). Anti–β-actin (Abcam) and anti-histone H1 (AbD Serotec) were used as loading controls. PP biopsies were taken from patients undergoing colonoscopy who had no signs of inflammation. All patients took part in this study after written informed consent. Pediatric tissue was obtained with parental consent. This study was approved by the local ethics committee. Epithelial cells were removed with 1 mM EDTA in HBSS containing 100 U/ml penicillin and 100 μg/ml streptomycin for 30 min. A single-cell suspension was prepared in RPMI 1640/10% FBS/penicillin/streptomycin/50 μg/ml gentamicin with collagenase D (1 mg/ml; Roche, Burgess Hill, U.K.) and DNase (10 U/ml; Roche) for 1 h.
Peripheral blood was obtained from buffy coats (National Blood Service, Brentwood, U.K.). Mononuclear cells were isolated by density centrifugation using Ficoll Paque (GE Healthcare, Buckinghamshire, U.K.). Blood monocytes were sorted with MACS CD14 micro beads (Miltenyi Biotech, Surrey, U.K.), according to manufacturer’s instructions. Monocytes were cultured in RPMI 1640 medium supplemented with 10% FBS, penicillin/streptomycin, 2 mM l-glutamine, and 1% nonessential amino acids. GM-CSF and IL-4 were added at concentrations of 800 U/ml each. Cells were cultured over a period of 6 d with cytokines being replenished after 3 d.
Bacterial strains, plasmids, and primers used in this study are listed as supplementary information in Supplemental Tables I, II, and III, respectively. Mutants of the EPEC O127:H6 strain E2348/69 constructed for this study were obtained using the PCR one-step λRed recombinase method (14) and primers listed in Supplemental Table III. The genes encoding the effectors proteins were amplified by PCR using primers listed in Supplemental Table III, Deep Vent DNA polymerase (New England BioLabs, Ipswich, Massachusetts, MA) and genomic DNA from EPEC E2348/69 strain. Plasmids with nleE1 and nleB1 genes were obtained by digestion with restriction enzymes cutting at the 5′ end of the primers and by ligation of the purified digested PCR product into pSA10 and pRK5. To obtain plasmid pSA-espL, the espL PCR product was cloned into TA cloning vector pCR2.1TOPO (Invitrogen) and the espL DNA fragment was then excised from pCR2.1 TOPO by EcoRV–PstI digestion and ligated into pSA10. Bacteria were cultured for 8 h at 37°C in LB broth, then subcultured 1:500 in RPMI 1640 medium/10% FBS at 37°C overnight. Bacterial cells were added to the DCs at a multiplicity of infection of 1:100 and incubated at 37°C. For the analysis of CD80, CD83, and CD86 expression, DCs were cultured with bacteria or LPS (20 ng/ml) for 4 h. Cells were then resuspended in fresh medium containing penicillin/streptomycin and 50 μg/ml gentamicin and cultured for an additional 24 h before FACS staining and analysis. For the investigation of T3SS into DCs by EPEC, we used a previously published reporter system that uses a translational fusion between the effector protein NleD and the β-lactamase TEM-1 (15, 16). The presence of TEM-1 in the host cell can be detected with the fluorescence resonance energy transfer (FRET)-based green fluorescent substrate CCF2/AM (520 nm emission) that enters the cells and emits blue fluorescence (447 nm emission) upon cleavage by TEM-1 (disruption of the green FRET signal). DCs were cocultured with EPEC E69 pcX-NleD-TEM-1 in RPMI 1640/10% FBS/1 mM IPTG for 4 h and subsequently loaded with 1 μM CCF2/AM (Invitrogen) in HBSS for 1 h at room temperature. The cells were washed and analyzed for fluorescence. The translocation of NleE1 was analyzed accordingly using E69 pcX-NleE1-TEM-1. Postinfection for 4 h, DCs were seeded on poly-l-lysine coated coverslips. Cells were fixed with 3% paraformaldehyde for 15 min and permeabilized with 0.1% Triton X100/PBS for 5 min. Primary and secondary Abs were applied for 45 min at 37°C each. DAPI, 1 μg/ml, was used for nuclear counterstaining. Isotype control Igs and omission of primary Abs were used as controls. Images were acquired by confocal laser scanning microscopy with a LSM 510 Meta, Plan-Neofluar 40× oil/0.50 objective (Carl-Zeiss, Jena, Germany) and processed by LSM 5 Image Examiner and Adobe Photoshop software. Surface staining was done in 20% human serum in PBS for 30 min on ice. For intracellular cytokine staining, cells were cultured with bacteria and 2 μM monensin for 4 h, fixed in Leucoperm (AbD Serotec) solution A, followed by permeabilization in solution B and stained for 30 min. Flow cytometry was performed using the LSR II analyzer (Becton Dickinson) and data were analyzed with FACS Diva software. Annexin V and propidium iodide (PI) staining was used to identify apoptotic and necrotic cells. Cells were resuspended in binding buffer (10 mM Hepes/NaOH, pH 7.4, 140 mM NaCl, 2.5 mM CaCl2) and stained with 5 μl annexin V-FITC and 5 μg /ml PI (both BD Bioscience) for 15 min. A total of 400 μl binding buffer was added and cells analyzed immediately by flow cytometry. Viability of DCs that have been injected with NleE-TEM-1 has been investigated by adding the far-red fluorescent DNA dye DRAQ7 (10 min, working concentration 3 μM; Biostatus, Shepshed, U.K.), which stains nuclei of dead cells, before analysis. T84 cells (colonic cancer epithelial cells) of passage number 7–15 were cultured in DMEM/F12 Mix/10% FBS/penicillin/streptomycin/2 mM l-glutamine/1% nonessential amino acids. Cells were seeded on the upper side of collagen-treated membranes (6.5 mm diameter, 3 μm pore size; Corning, NY) and cultured until the transepithelial resistance (TER) reached >1000 Ωcm2. The transwell inserts were positioned upside down in a 6-well plate and a drop containing 4 × 105 DCs was placed onto the membrane. DCs were allowed to adhere for 4 h at 37°C. Afterward, the transwell inserts were inverted and bacteria were added from the apical side. After 2 h, the plate was centrifuged to detach the DCs from the membrane. Cells were clearly identified as DCs by light microscopy before they were further processed for the β-lactamase translocation assay. Transwell membranes were also subjected to immunofluorescence staining. HeLa cells were cultured in DMEM with 10% FBS, penicillin/streptomycin and seeded on poly-l-lysine–coated cover glasses. Cells were transfected with plasmids encoding for NleE-myc or the empty vector using Fugene HD (Roche). One day after transfection, cells were treated with 20 ng/ml IL1-β for 30 min. 57A HeLa cells (17), which are stably transfected with the luciferase gene under the control of NF-κB regulatory elements, were transfected with the plasmid encoding for NleE-myc or the empty vector. To ensure an equal transfection efficiency of different amounts of DNA, transfection was monitored by cotransfection of a GFP-encoding plasmid (Lonza, Basel, Switzerland). After 36 h, cells were seeded in duplicates and treated with 10 ng/ml TNF-α for 6 h. Luciferase substrate (Promega, Southampton, U.K.) was added to the cells and the luminescence measured. Cytokine concentrations were determined by ELISA using kits from R&D Systems and ImmunoTools (Friesoythe, Germany). IL-2 ELISA kit was purchased from PeproTech (Rocky Hill, NJ). Nuclear and cytosolic p65 concentrations were determined using the p65 ELISA from Imgenex (San Diego, CA). Cytosolic and nuclear extracts of DCs were prepared with a nuclear/cytosol fractionation kit (BioVision, Cambridge BioScience, Cambridge, U.K.). After SDS-PAGE, proteins were transferred to nitrocellulose membranes and blocked with nonfat milk or BSA in 0.1% Tween/TBS for 1h before incubation with primary Abs over night. Secondary Abs were conjugated to HRP (DAKO, Cambridgeshire, U.K.) and incubated on the membranes for 1 h. ECL Plus detection system (GE Healthcare) was applied for 5 min before the membranes were exposed to X-ray film. 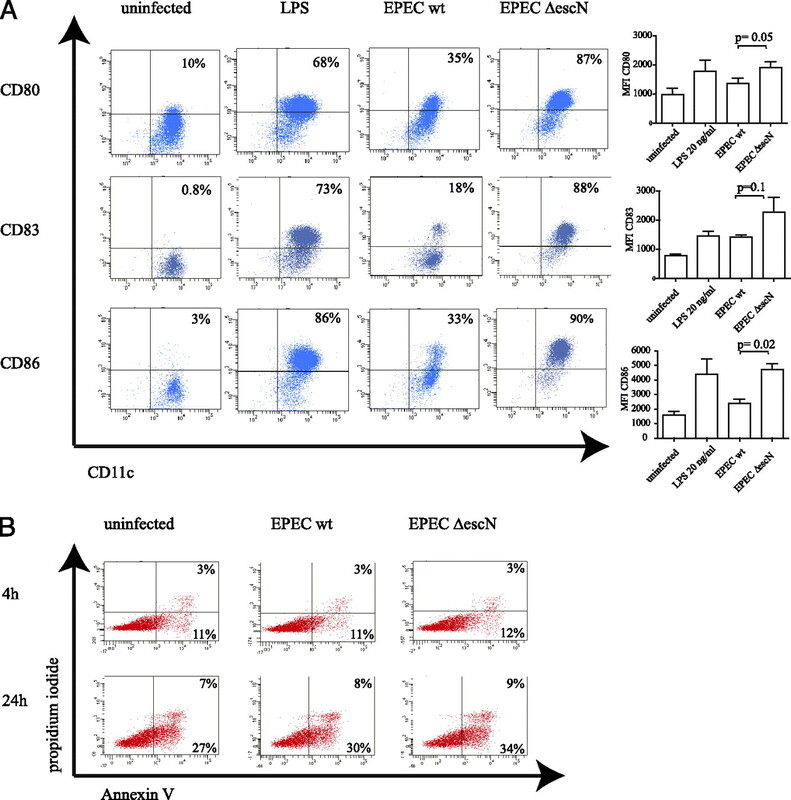 Monocyte-derived DCs (mdDCs) were cocultured with different EPEC strains for 4 h, before they were added to untreated allogenic PBMCs, which served as responder cells in MLRs in the ratio 4 × 105 PBMCs to 2 × 104 DCs. After 6 d of culture, the concentration of IL-2 in the supernatants was measured as marker of lymphocyte activation. The software GraphPad Instat was used to perform the unpaired Student t test with Welch correction. Results are presented as means + SD. A p < 0.05 was considered significant. We first set out to establish if EPEC could inject effector proteins into DCs. Tir, the translocated intimin receptor, is inserted by EPEC into the plasma membrane of epithelial cells by the T3SS (18, 19). We cocultured human mdDCs for 4 h with GFP-expressing EPEC (EPEC-GFP) and EPEC ΔescN-GFP, a GFP-expressing mutant, which lacks the ATPase escN and cannot translocate proteins by T3SS. Confocal imaging revealed that Tir was detectable in the plasma membrane of mdDCs cultured with EPEC-GFP (Fig. 1A). DCs cultured with the ΔescN mutant were closely surrounded by bacteria, but Tir was not detectable. 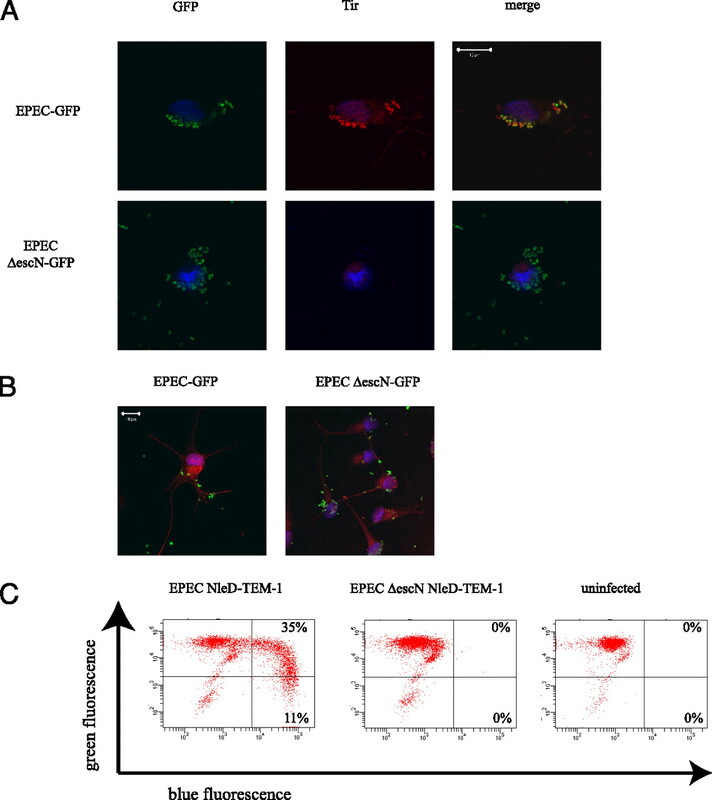 EPEC-GFP and EPEC ΔescN-GFP attached to mdDCs equally well (Fig. 1B). To directly visualize how efficiently EPEC translocates effectors into mdDCs, we used a reporter system based on the fusion of the bacterial effector protein NleD and the β-lactamase TEM-1. TEM-1 in cells is detected by its ability to cleave the green fluorescent substrate CCF2/AM to yield blue fluorescence. Approximately 46% of mdDCs cocultured with EPEC NleD-TEM-1 and loaded with CCF2/AM emitted blue fluorescence or double-positive fluorescence, indicating injection of the fusion protein (Fig. 1C). In contrast, mdDCs cultured with EPEC ΔescN NleD-TEM-1, showed no blue fluorescence (Fig. 1C). EPEC injects effector proteins into mdDCs. A, mdDCs were cultured with EPEC–GFP or EPEC ΔescN-GFP (green) for 4 h and stained for Tir (red).The images are representative for three independent experiments. Scale bar, 10 μm. B, mdDCs were cultured with EPEC–GFP or EPEC ΔescN-GFP (green) for 4 h and stained for CD11c (red). Images are from one of three independent experiments with similar results. Scale bar, 10 μm. C, mdDCs were cultured with EPEC NleD–TEM-1 or EPEC ΔescN NleD–TEM-1 for 4 h, loaded with CCF2/AM for 1 h and analyzed by flow cytometry. Experiments have been performed four times. Representative plots are shown. DCs are known to upregulate costimulatory molecules upon contact with bacterial components. To investigate if EPEC can influence the expression of these cell surface markers, we analyzed the costimulatory molecules CD80 and CD86 as well as the maturation marker CD83 on mdDCs after culture with EPEC. After culture with the escN mutant or LPS, mdDCs strongly unregulated expression of CD80, CD83, and CD86 (Fig. 2A). Cells cultured with wild-type (wt) EPEC showed only moderate increase in accessory molecules. The difference was unlikely to be due to differences in the ability of the two strains to come into contact with the DCs (Fig. 1B). Antiannexin V and propidium iodide (PI) were used to assess viability. There was no increased cell death in DCs after 4 h of culture with bacteria and 4 h infection plus 24 h additional culture in DCs compared with uninfected controls (Fig. 2B). EPEC reduces the expression of costimulatory molecules on mdDCs. A, mdDCs were cultured with EPEC wt, EPEC ΔescN, or LPS (20 ng/ml) for 4 h. Penicillin/streptomycin and gentamicin was added and cells cultured for an additional 24 h. Expression of CD11c, CD80, CD83, and CD86 was analyzed by flow cytometry. Results are representative for three independent experiments. The graphs show the mean fluorescence intensities (MFI) +SD for these markers (n = 3). B, Cell viability of DCs was assessed by PI and annexin V staining after 4 h of infection and after 4 h infection and 24 h culture with antibiotics. DCs interacting with pathogenic bacteria typically release large amounts of proinflammatory cytokines. 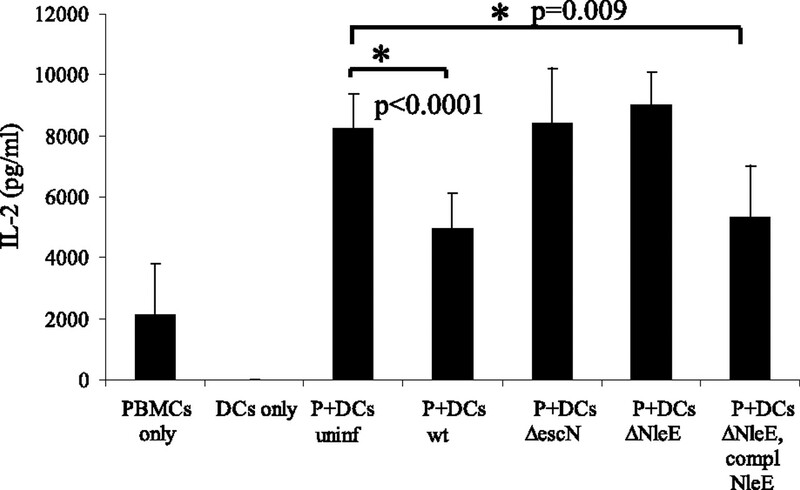 DCs cultured with the ΔescN mutant produced high levels of the proinflammatory cytokines IL-8, TNF-α, and IL-6, whereas cells cultured with the wt bacteria secreted very small amounts of these cytokines (Fig. 3A). To confirm this, we performed an intracellular TNF-α staining and found that 46% percent of CD11c+ mdDCs cultured with EPEC ΔescN were positive for intracellular TNF-α compared with 4.7% of mdDCs cultured with EPEC wt (Fig. 3B). 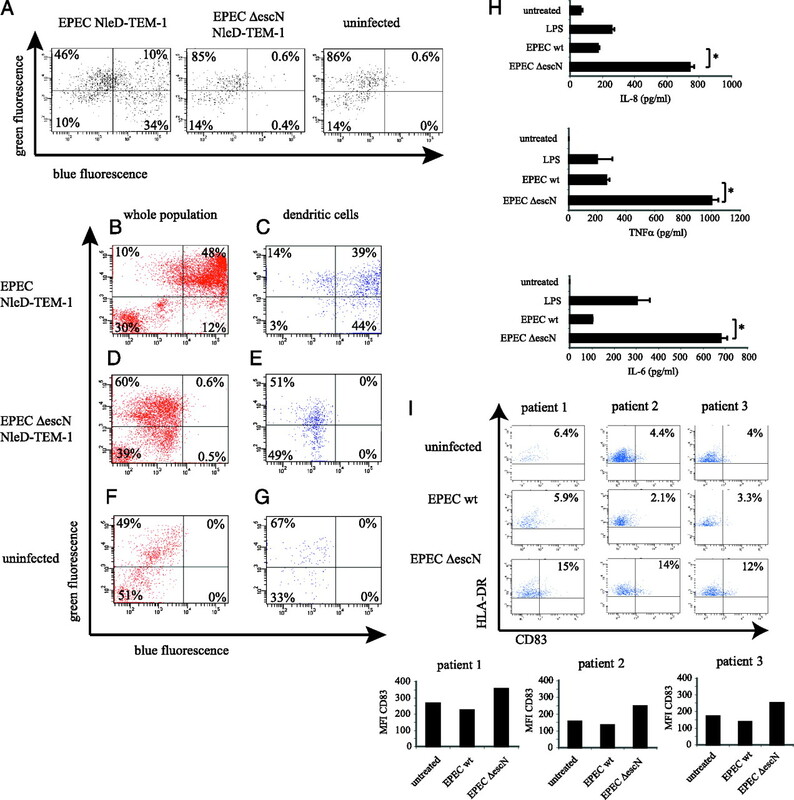 EPEC impairs proinflammatory cytokine production in mdDCs. A, mdDCs were cultured with EPEC wt or EPEC ΔescN for 4 h. Cytokine concentrations in supernatants were determined by ELISA. Data show the means + SD of four independent experiments. B, mdDCs were treated with LPS (20 ng/ml) or cultured with EPEC wt or EPEC ΔescN for 4 h. Gentamicin was added and cells were cultured with 2 μM monensin before staining CD11c and intracellular TNF-α. Plots are representative of three experiments with similar results. C, mdDCs were cultured with EPEC wt, EPEC ΔescN, or LPS (20 ng/ml) for indicated times. Cytosolic and nuclear fractions were subjected to SDS-PAGE and immunoblotting. The blot is representative of five independent experiments with similar results. D, mdDCs were cultured with EPEC wt and EPEC ΔescN for indicated times and p65 concentration in nuclear and cytosolic extracts was determined by ELISA. The graph shows mean values +SD (n = 4). Because the expression of IL-8, TNF-α, and IL-6 is regulated by NF-κB, we determined whether EPEC affects NF-κB signaling in DCs. Immunoblotting revealed identical nuclear accumulation of p65 at 1 h with both wt and ΔescN mutant. At 3 h, however, although nuclear p65 was still high in cells cultured with the ΔescN mutant, there was very little in cells cultured with wt bacteria (Fig. 3C). Total I-κB α decreased after 30 min in cells cultured with both wt EPEC and the ΔescN mutant; however, by 2 h, levels had increased in cells treated with the wt bacteria but remained low in those treated with the ΔescN mutant (Fig. 3C). Consistent with this, phosphorylated I-κB-α increased in cytosolic fractions of mdDCs cultured with EPEC wt and the ΔescN mutant in the first hour, but by 3 h was back to the levels seen in untreated cells. However, p-I-κB-α remained high in the cells cultured with the ΔescN mutant. We also quantified nuclear p65 by ELISA. Nuclear p65 in mdDCs cultured with the wt bacteria increased and then returned to the basal level by 4 h, but remained high for up to 4 h in cells cultured with the escN mutant. The cytosolic p65 concentration stayed low in the wt samples at 2 h and 4 h postinfection (Fig. 3D). For live cell imaging, we transfected HeLa cells with pds-Red1-p65 and added either EPEC wt or EPEC ΔescN. For the latter, there was rapid nuclear p65 accumulation that persisted for 40 min. For the wt EPEC, we could barely detect accumulation of p65 in the cell nuclei (Supplemental Fig. 1). Using directed mutagenesis of the different pathogenicity islands in EPEC, we identified Island 4 (encoding the effectors EspL, NleE1, and NleB1) as a locus for the effector that is responsible for the modulation of NF-κB signaling in mdDCs. Cells cultured with Island 4 mutants showed markedly higher production of IL-8, TNF-α, and IL-6 than cells cultured with the wt bacteria (Fig. 4A). Complementation with each of the three effectors encoded on Island 4 showed that only NleE was restoring the reduction of cytokine secretion (Supplemental Fig. 2) identifying NleE as the most likely protein that targets the NF-κB pathway (in the figures, NleE is referred to as NleE1 to differentiate it from the shorter copy NleE2 present on Island 5). We then created a single mutation of nleE. mdDCs cultured with EPEC ΔnleE showed high secretion of IL-8, TNF-α, and IL-6. In contrast, cytokine secretion was markedly reduced in mdDCs cultured with EPEC ΔnleE complemented with a plasmid encoding NleE (Fig. 4A). The importance of NleE for the downregulation of the inflammatory response in DCs was confirmed by immunoblotting for p65. DCs cultured with EPEC ΔnleE showed strong nuclear translocation of p65 after 30 min and 1 h of infection, whereas cells cultured with the complemented strain had little nuclear p65 after 1h (Fig. 4B). We attribute the more rapid kinetics compared with wt bacteria to the higher expression of NleE. We also sought to determine whether NleE could inhibit NF-κB activation in DCs in response to another signal. When we added IL1-β after 1 h of infection with EPEC ΔnleE, there was still high induction of nuclear p65 after 30 min; however, cells pretreated with NleE complemented bacteria were unresponsive to IL1-β (Fig. 4B). We also demonstrated the translocation of NleE into mdDCs using the TEM-1 translocation assay. Twenty-eight percent of cells emitted a blue fluorescence indicating NleE translocation (Fig. 4C). To assess the viability of DCs that have been injected with NleE–TEM-1, we added the viability dye DRAQ7 after loading the cells with CCF2/AM. Hardly any of the injected cells took up DRAQ7 (0.1%), indicating that they are alive (Fig. 4D). NleE was next cloned into a myc-tagged vector and transfected into HeLa cells. Cells were treated with IL1-β and analyzed for the presence of p65 in the nucleus by confocal microscopy. No NleE-myc transfected cells showed translocation of p65 into the nucleus, whereas 35% of NleE nontransfected cells in the same sample showed nuclear p65 (Fig. 4E, 4F). A similar level of nuclear p65 was also seen in untransfected (33%) and vector transfected cells (43%) treated with IL1-β (Fig. 4E, 4F). Finally, we used a HeLa–NF-κB reporter cell line to quantify the effect of NleE. 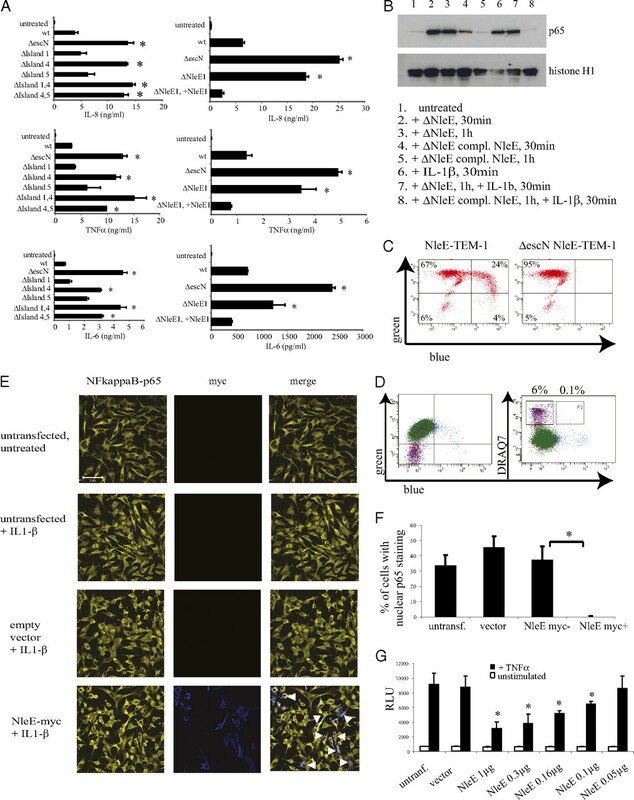 TNF-α elicited a large increase in luciferase activity; however, transfection with graded amounts of plasmid-expressing NleE reduced luciferase activity in a dose-dependent fashion (Fig. 4G). Expression of NleE impairs the proinflammatory response of mdDCs and HeLa cells. A, mdDCs were cultured with indicated EPEC strains for 4 h and cytokines determined by ELISA. Data are means + SD (n = 3 experiments). *p < 0.05. B, mdDCs were cultured with EPEC strains for indicated times and stimulated with IL1-β. The blot is representative of two experiments. C, mdDCs were cultured with EPEC NleE–TEM-1 or EPEC ΔescN-NleE–TEM-1 for 4 h, loaded with CCF2/AM for 1 h and analyzed by flow cytometry. Dot plots are representative of three experiments with similar results. D, mdDCs were treated as described in Fig. 4C, but just before analysis the viability dye DRAQ7 was added. The number of NleE–TEM-1 injected cells (“blue” population) was assessed for cell viability. The plots are representative of three experiments with equal results. E, HeLa cells were transfected with the empty myc-vector or NleE-myc. After adding IL1-β for 30 min, cells were stained for myc and p65 and analyzed for nuclear p65 staining by confocal microscopy. White arrow heads mark the NleE-myc transfected cells, which lack nuclear p65 staining. Scale bar, 50 μm. Quantitative analysis of the microscopic pictures is shown in F. Counting was done in 12 random fields. “NleE myc+” and “NleE myc−” shows the percentage of nuclear p65 staining of the NleE-myc transfected cells and NleE-myc untransfected cells, respectively, in the same samples. Values are means + SD (n = 12), p < 0.0001. Number of analyzed cells per condition: n ≥ 113. Results were obtained from three independent experiments. G, The 57A HeLa cells were transfected with the myc-vector or different amounts of NleE-myc plasmid, cultured for 36 h and then treated with TNF-α for 6 h before adding luciferase substrate and analyzing luminescence. The graph shows mean values + SD from three experiments with n between 6 and 12. *p < 0.05. Because EPEC reduces the expression of costimulatory and maturation markers on DCs, we went on to investigate whether DCs injected by EPEC are less efficient in stimulating T cells in a MLR, as measured by IL-2 production. T cell activation was lower in MLRs with DCs that had previously been cocultured with the wt strain compared with uninfected DCs. DCs cocultured with the strain complemented with NleE (ΔNleE, complementary NleE) also induced less IL-2 production by T cells in the MLRs (Fig. 5). EPEC impairs the DC function in MLRs. mdDCs were cocultured with different EPEC strains for 4 h, before they were added to untreated allogenic PBMCs (P). After 6 d of culture, the concentration of IL-2 in the supernatants was measured as marker of lymphocyte activation. Each MLR was done in triplicate. The graph shows mean values + SD of three independent MLRs. We next determined whether EPEC could inject effectors into human PP DCs. We cocultured single-cell suspensions of PP mononuclear cells (PPMCs) with EPEC NleD-TEM-1 and the escN mutant and loaded the cells with CCF2/AM. 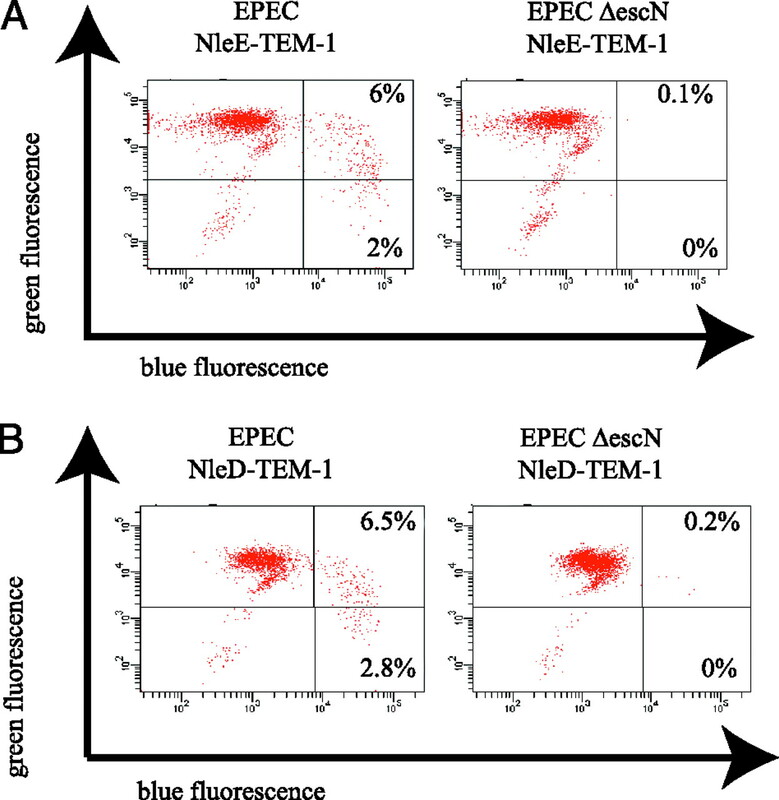 Thirty-four percent of DCs cultured with EPEC NleD–TEM-1 emitted blue fluorescence and 10% a double-positive green/blue signal (indicating that not all CCF2/AM had been cleaved) compared with 1% of cells cultured with the ΔescN mutant (Fig. 6A). Next, we tested if EPEC can inject effector proteins into DCs of intact PP. The tissues were cultured with either EPEC NleD–TEM-1 or EPEC ΔescN NleD–TEM-1 for 4 h before single-cell suspensions were made in culture medium containing penicillin/streptomycin and gentamicin. We detected a blue signal (12%) and double-positive green/blue signal (48%, Fig. 6B) when we examined the whole PP cell population of the NleD–TEM-1 sample. When we analyzed the DCs in the sample, 44% emitted a blue signal and 39% a double-positive green/blue signal (Fig. 6C). There were virtually no blue or blue/green cells in suspensions from biopsies cultured with the escN mutant (Fig. 6D, 6E) or from uninfected biopsies (Fig. 6F, 6G). We are aware that EPEC could inject effector proteins into cells at the edges of the cut biopsies; however, the vast majority of DCs in human PP are present in the subepithelial dome, distant from the cut edge (13). EPEC injects effectors into PP DCs. A, Human PPMCs were cultured in medium containing 1 mM IPTG for 4h with either EPEC NleD–TEM-1 or EPEC ΔescN-NleD–TEM-1. Cells were loaded with CCF2/AM and stained for HLA-DR and lineage markers to identify DCs (= lineage−/ HLA-DR+ population). DCs were then analyzed for green and blue fluorescence. Dot plots show one of three independent experiments with similar results. B–G, PP biopsies were cultured in medium and IPTG with EPEC NleD–TEM-1 or EPEC ΔescN- NleD–TEM-1 for 4 h. A single-cell suspension was prepared with addition of penicillin/streptomycin and gentamicin. Cells were CCF2/AM-loaded and stained for HLA-DR and lineage markers to gate on DCs. Fig. 5B, 5D, and 5F show the analysis of the whole PP population and Fig. 2C, 2E, and 2G show the analysis of PP DCs. Dot plots show one of three independent experiments. H, PPMCs were cultured with EPEC wt, EPEC ΔescN, and LPS (20 ng/ml) for 4 h. Gentamicin was added and cells cultured overnight. Cytokine concentrations were determined by ELISA. Data are means + SD (n = 3 experiments). *p < 0.001. I, PPMCs of three patients were cultured with EPEC wt or EPEC ΔescN for 4 h and cultured with gentamicin for 24 h before staining of surface markers. DCs were identified as lineage−/HLA-DR+ population, which was analyzed for CD83 expression by flow cytometry. Bar graphs show the CD83–MFI for each patient after indicated treatments. To study if EPEC also elicits reduced cytokine production in PPMCs compared with the ΔescN mutant, we cultured PPMCs with both strains for 4 h. IL-8, TNF-α, and IL-6 concentrations were significantly lower in cells cultured with EPEC wt compared with cells cultured with ΔescN (Fig. 6H). Neither of the bacterial strains increased cell death (Supplemental Fig. 3). Also, DCs from PP of three different patients showed an increased expression of CD83 after culture with the ΔescN mutant compared with the wt strain, as analyzed by flow cytometry (Fig. 6I). To model the in vivo situation in the intestine, we investigated whether EPEC can inject effectors into mdDCs that are cultured on the basal side of a confluent epithelial layer. Therefore, we seeded mdDCs onto the basal side of membrane filters that had an apical confluent layer of T84 cells with high TER (TER > 1000 Ωcm2), and added EPEC NleE–TEM-1 or EPEC ΔescN NleE–TEM-1 to the apical side of the transwell (see Supplemental Fig. 4). After 2 h, mdDCs were gently detached from the basal side of the membrane and loaded with CCF2/AM. Flow cytometry revealed that 8% DCs from the transwell with EPEC NleE–TEM-1 emitted blue or double-positive blue/green fluorescence. Blue cells were undetectable in DCs detached from membranes of transwells cultured with EPEC ΔescN NleE–TEM-1 (Fig. 7A). Infection with EPEC NleE–TEM-1 for 2 h led to no significant decrease in TER and no bacteria were cultivatable from the basal side of the transwell. To compare the efficiency by which NleE is translocated in this model, we also performed the transwell assay with EPEC NleD–TEM-1 and EPEC ΔescN NleD–TEM-1, respectively. After 2 h of coculture, we detected 9% of blue and double-positive blue/green DCs by flow cytometry (Fig. 7B), demonstrating that NleE and NleD are equally well translocated into mdDCs in our transwell system. Both effectors NleE and NleD are translocated into DCs in a gut transwell model. A, T84 cells (apical) and mdDCs (basal) were cultured in transwell inserts. EPEC NleE–TEM-1 or EPEC ΔescN-NleE–TEM-1 were added to the apical compartment with the addition of 1 mM IPTG and cultured for 2 h. mdDCs were detached, loaded with CCF2/AM, and analyzed for fluorescence by flow cytometry (cells of six wells were pooled to increase the number of cells for analysis). Data are representative for three experiments. B, The same experimental procedure as in Fig. 6A was applied; the bacterial strains used were EPEC NleD–TEM-1 and EPEC ΔescN- NleD–TEM-1. Cells were analyzed by flow cytometry. Plots represent one of three experiments. We show in the presented study that EPEC use the T3SS to inject effector proteins into human gut DCs. We have attempted to mimic the physiological context in which this may occur in the human gut, namely by focusing on human PP cells (the site EPEC initially colonize), and particularly on DCs, which send processes into the gut lumen to sample pathogens. Taken together, our observations that EPEC injects effector proteins into mdDCs reaching through a model epithelium and DCs in whole PP biopsies suggest that the process of injection into DCs is indeed a phenomenon with in vivo significance. The second and critically important part of the study is the functional consequences of this interaction. When DCs were cultured with an EPEC ΔescN mutant, there was massive NF-κB activation and the secretion of large amounts of IL-8, TNF-α, and IL-6. EscN is an ATPase, which is essential for the formation of the T3SS molecular syringe and for the secretion of effector molecules. The response elicited by these bacteria in DCs is presumably in response to recognition of PAMPs. There is no a priori reason to assume that the wt EPEC has any deficiency in PAMPs, yet when cocultured with DCs and HeLa cells, after a brief burst of NF-κB activation and cytokine secretion, the inflammatory response ceased. It is also well established that stimulation of DCs with bacteria leads to marked increase in surface expression of the costimulatory molecules CD80, CD86, and of the maturation marker CD83. EPEC ΔescN elicited a marked increase in the expression of all of these molecules, but wt EPEC had only little effect. In addition, our study shows that DCs injected by the wt strain are less efficient in stimulating allogenic T cells and we were also able to show that EPEC overexpressing NleE were particularly potent in inhibiting MLR. Taken together with the NF-κB results and the cytokine secretion data, it seems clear that wt EPEC is markedly less inflammatory than EPEC lacking the ability to inject effector proteins into DCs. We were also able to show that EPEC inhibits proinflammatory cytokine expression by human PP cells. These results support data obtained on rabbit enterocytes (6) and human epithelial cell lines cells (9–11), which showed a type III secretion dependent reduction of IL-8 production. Similar results were recently reported for EHEC, which can downregulate the proinflammatory cytokine production by intestinal epithelial cells in response to its own Shiga toxin (20) and uses the effector NleH1 to subvert NF-κB–dependent transcription by binding to the ribosomal protein s3 (21). We were concerned, however, that the differences between wt EPEC and the ΔescN mutant in terms of cytokine secretion and costimulatory molecule expression could be related to quantitative differences in bacterial interactions with DCs. Evidence that this is not the case is provided by the fact that both strains initially activate NF-κB; however, we believed that only by identifying an effector responsible for the effect could we rule out this possibility. So we sequentially knocked out the major pathogenicity islands in wt EPEC in an attempt to abolish the effect. Deletion of pathogenicity Island 4 abolished the inhibitory effect and when we focused down on the three proteins encoded on this locus, a single deletion of nleE, also abolished the inhibitory effect. Complementation of nleE led to a strongly reduced secretion of inflammatory cytokines and impaired nuclear translocation of NF-κB p65 in mdDCs. HeLa cells transfected with nleE were unresponsive to IL1-β and TNF-α and did not show p65 translocation. These results demonstrate that NleE is a powerful anti-inflammatory effector protein. EPEC’s Island 4 corresponds to the locus encoding the three effectors, NleE1, NleB1, and EspL on the recently described integrative element IE6 of EPEC E2348/69 genome (22). This island is conserved in A/E pathogens, known as O-Island 122 in EHEC O157:H7, and is significantly associated with the most pathogenic strains (23, 24). A copy of Island 4, Island 5, is present on the integrative element IE2 in EPEC E2348/69, but the genes for nleB and espL have frameshift mutations and are theoretically nonfunctional. The copy of nleE on Island 5 has an internal deletion of 118 nt but the open reading frame is conserved suggesting that the protein is produced. However, to avoid the possible complementation by these effectors, we also deleted Island 5 together with Island 4. NleB, EspL, and NleE produced by A/E mouse pathogen Citrobacter rodentium are required for full colonization and full induction of disease in mice (24–26). Mutation of nleB leads to the most important attenuation of virulence with a strong reduction of colonization and no mortality in infected mice (24, 25). Mutation of espL (entL) or nleE induce a lower but significant reduction in colonization and a delayed mortality (24, 26). EspL (EspL2) produced by EHEC was recently shown to modify the host cell cytoskeleton via binding to annexin-2, thought to be potentially involved in adherence (27). NleE is homologous to the Shigella flexneri effector OspZ and both are required for the transepithelial migration of polymorphonuclear leukocytes in a polarized T84 intestinal cells model of infection (28). We were able to verify the anti-inflammatory effects of NleE itself by direct transfection into HeLa cells and showed that it completely inhibited NF-κB activation. The mechanism by which NleE mediates its effects in mammalian cells is unknown and we are currently using yeast 2 hybrid to find the host cell partner protein of NleE. In recent months, simultaneously to our own study, two other research groups identified NleE as an effector which interferes with the NF-κB pathway in epithelial cells (29, 30), confirming our results. Our study, however, has even broader significance as we show for the first time that EPEC hampers human DC function, which might be important in the early phase of the infection in the gut. These findings align EPEC along with invasive pathogens such as Yersinia, Shigella, or Salmonella, which use the T3SS to inject different effectors to inhibit the host immunity. For example, Yersinia uses the effector YopJ to mediate strong anti-inflammatory activity and inhibit both the MAPK and NF-κB pathways. YopJ is an acetyltransferase, which acetylates the MAPK kinases (MAPKKs) and the I-κ kinases (IKKs) preventing the phosphorylation and activation of these regulators (31). This study may help to explain why EPEC show a tropism for the FAE in the ileum (12). The FAE covers PPs and isolated lymphoid follicles and contains M cells, which transport gut Ags across the epithelium into the dome area that contains a dense population of subepithelial myeloid DCs (13). These DCs send dendrites into the gut lumen to directly contact intestinal bacteria. We would like to speculate that EPEC colonize these structures, especially early in infection, to actively inhibit DC function and thereby slowdown the rate at which protective immunity is generated. We thank Ijeoma Joe-Njoku, Dhrumil Patel, and Ann Wheeler for technical assistance. The 57A cells were kindly provided by Panagiotis Kabouridis. We also thank all patients who took part in this study.
. 2001. Dendritic cells express tight junction proteins and penetrate gut epithelial monolayers to sample bacteria. Nat. Immunol. 2: 361–367.
. 2005. CX3CR1-mediated dendritic cell access to the intestinal lumen and bacterial clearance. Science 307: 254–258.
. 2006. Dynamic imaging of dendritic cell extension into the small bowel lumen in response to epithelial cell TLR engagement. J. Exp. Med. 203: 2841–2852.
. 2008. Regulation of humoral and cellular gut immunity by lamina propria dendritic cells expressing Toll-like receptor 5. Nat. Immunol. 9: 769–776.
. 2005. Enteropathogenic and enterohemorrhagic Escherichia coli infections: translocation, translocation, translocation. Infect. Immun. 73: 2573–2585.
. 2005. Role of EspA and intimin in expression of proinflammatory cytokines from enterocytes and lymphocytes by rabbit enteropathogenic Escherichia coli-infected rabbits. Infect. Immun. 73: 103–113.
. 2001. Implication of mitogen-activated protein kinases in T84 cell responses to enteropathogenic Escherichia coli infection. Infect. Immun. 69: 1298–1305.
. 2003. Suppression of NF-kappa B activation and proinflammatory cytokine expression by Shiga toxin-producing Escherichia coli. J. Immunol. 170: 2074–2082.
. 2008. Flagellin-dependent and -independent inflammatory responses following infection by enteropathogenic Escherichia coli and Citrobacter rodentium. Infect. Immun. 76: 1410–1422.
. 2007. Enteropathogenic Escherichia coli (EPEC) inactivate innate immune responses prior to compromising epithelial barrier function. Cell. Microbiol. 9: 1909–1921.
. 2006. Balance of bacterial pro- and anti-inflammatory mediators dictates net effect of enteropathogenic Escherichia coli on intestinal epithelial cells. Am. J. Physiol. Gastrointest. Liver Physiol. 290: G685–G694.
. 2002. Tissue tropism of enteropathogenic Escherichia coli strains belonging to the O55 serogroup. Infect. Immun. 70: 4362–4368.
. 2002. Expression of DC-SIGN by dendritic cells of intestinal and genital mucosae in humans and rhesus macaques. J. Virol. 76: 1866–1875.
. 2000. One-step inactivation of chromosomal genes in Escherichia coli K-12 using PCR products. Proc. Natl. Acad. Sci. USA 97: 6640–6645.
. 2004. Identification of the secretion and translocation domain of the enteropathogenic and enterohemorrhagic Escherichia coli effector Cif, using TEM-1 beta-lactamase as a new fluorescence-based reporter. J. Bacteriol. 186: 5486–5495.
. 2005. Characterization of two non-locus of enterocyte effacement-encoded type III-translocated effectors, NleC and NleD, in attaching and effacing pathogens. Infect. Immun. 73: 8411–8417.
. 1999. Nuclear retention of IkappaBalpha protects it from signal-induced degradation and inhibits nuclear factor kappaB transcriptional activation. J. Biol. Chem. 274: 9108–9115.
. 1997. Enteropathogenic E. coli (EPEC) transfers its receptor for intimate adherence into mammalian cells. Cell 91: 511–520.
. 1999. Binding of intimin from enteropathogenic Escherichia coli to Tir and to host cells. Mol. Microbiol. 32: 151–158.
. 2009. Enterohemorrhagic Escherichia coli suppresses inflammatory response to cytokines and its own toxin. Am. J. Physiol. Gastrointest. Liver Physiol. 297: G576–G581.
. 2009. Bacterial effector binding to ribosomal protein s3 subverts NF-kappaB function. PLoS Pathog. 5: e1000708.
. 2009. Complete genome sequence and comparative genome analysis of enteropathogenic Escherichia coli O127:H6 strain E2348/69. J. Bacteriol. 191: 347–354.
. 2006. Identification of virulence genes linked with diarrhea due to atypical enteropathogenic Escherichia coli by DNA microarray analysis and PCR. J. Clin. Microbiol. 44: 3703–3711.
. 2006. Bacterial genetic determinants of non-O157 STEC outbreaks and hemolytic-uremic syndrome after infection. J. Infect. Dis. 194: 819–827.
. 2006. Essential role of the type III secretion system effector NleB in colonization of mice by Citrobacter rodentium. Infect. Immun. 74: 2328–2337.
. 2007. Citrobacter rodentium virulence in mice associates with bacterial load and the type III effector NleE. Microbes Infect. 9: 400–407.
. 2009. Enterohemorrhagic Escherichia coli effector EspL2 induces actin microfilament aggregation through annexin 2 activation. Cell. Microbiol. 11: 337–350.
. 2008. The NleE/OspZ family of effector proteins is required for polymorphonuclear transepithelial migration, a characteristic shared by enteropathogenic Escherichia coli and Shigella flexneri infections. Infect. Immun. 76: 369–379.
. 2010. The type III secretion effector NleE inhibits NF-kappaB activation. PLoS Pathog. 6: e1000743.
. 2010. The type III effectors NleE and NleB from enteropathogenic E. coli and OspZ from Shigella block nuclear translocation of NF-kappaB p65. PLoS Pathog. 6: e1000898.
. 2006. Yersinia YopJ acetylates and inhibits kinase activation by blocking phosphorylation. Science 312: 1211–1214.